Does the term 3D event visualisation resonate with you at all? Is it something that you’ve heard of, but you’ve never paid attention to? You may know a little about 3D rendering software, but you’re probably unaware of the valuable ways it can benefit the early stages of your event development – until now. 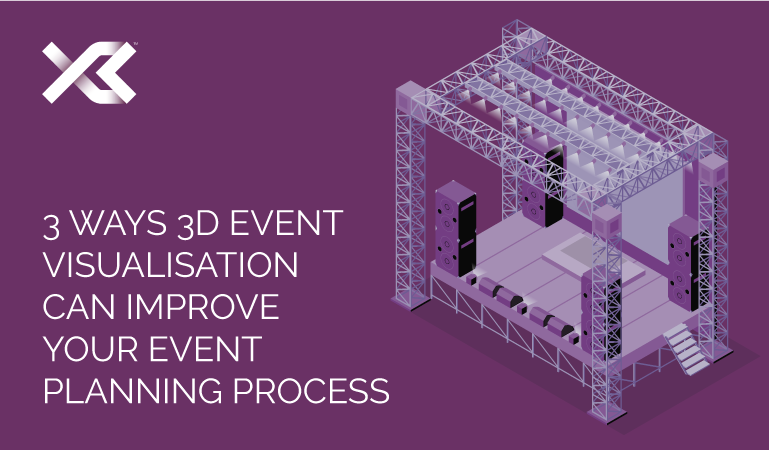 Here are the 3 ways 3D event visualisation can improve your event planning process. No matter your experience within the event planning arena, when you engage with an AV supplier you want the reassurance that they share your vision and fully understand the event brief that you’ve supplied to them. Using 3D rendering software early on in the event planning process can help provide visual confirmation that your AV team are on the same page as you and get what it is you are trying to achieve in terms of the look and feel of your event. Professional AV companies should work with you on a collaborative basis, to produce a couple of design concepts that can be refined in order to nail down a final creation that is bespoke to your specifications, and that can be produced in-line with your budget allocation. The way in which 3D design concepts are created and presented can also help give you an insight into how your AV partner will work with you throughout the entire process. It is a good opportunity for you to assess their AV credentials, and how they will manage you as a client. From the outset, finding an AV company that you can build a good working relationship with and trust with your AV requirements is key. Aligning the core components of your event from the off, can have a beneficial effect on its overall execution and can help create an integrated immersive experience for attendees. Unfortunately, sharing a quick doddle sketched in the back of your notepad of how you envision the event, is unlikely to have the same impact. Therefore, finding an AV production company that offers 3D visualisation as part of their service, will help you to shape your event brief into a tangible and shareable asset, that can support with driving your event forward. Wouldn’t it be great if money was no object and you were free to make all the decisions irrespective of price? The reality is that you are most likely working to a fixed event budget and reporting back to the powers at be on the costs being incurred. In some instances, event AV can be seen as an unnecessary expenditure. There can also be a hesitancy to spend on AV due to not having a clear understanding of what you will be getting for the financial outlay – this is where 3D event visualisation can play an integral part in helping you to influence budgetary spend. Many AV production businesses will take the time to meet with the event team and decision makers. They will talk through the service they intend to provide and present the 3D visual concepts; which should be designed to meet both the event brief and the outlined budget. This can serve as powerful evidence as to the impact that can be created with expert AV production. As well as explaining the other advantageous reasons your event needs AV, providing professional and sophisticated design visuals in-line with a clear breakdown of costs, can help justify the required AV spend and prompt sign-off. X3 Solutions are an expert audio visual solutions provider with over 20 years’ experience. We understand how important it is to be able to visualise the AV elements of your event and that’s why we offer 3D event visualisation as part of our event and conference production services. Give us your brief and trust us to deliver an experience that will captivate your delegates. Call +44(0)1252 519303 or send a message to info@x3solutions.co.uk today.